Welcome! 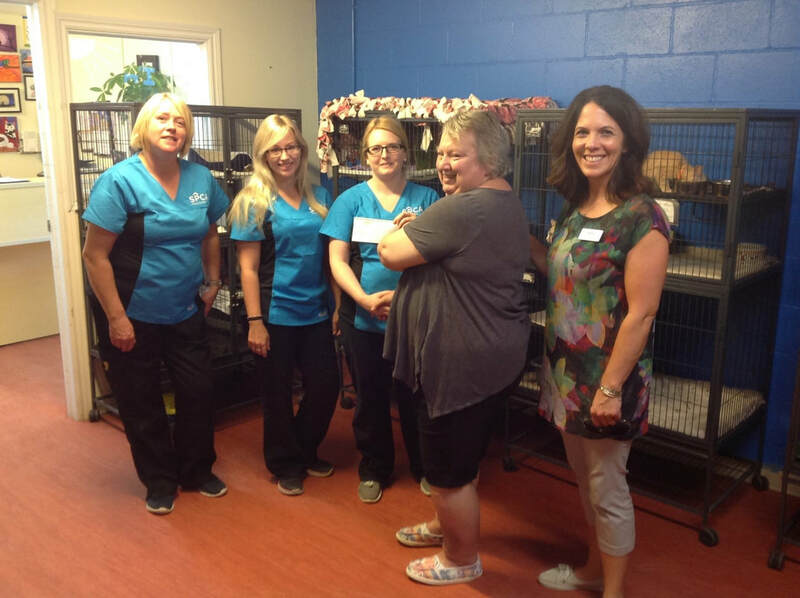 The Meadows Home for Special Care is a 105 single room not-for-profit licensed nursing care and people centered facility located in the town of Yarmouth, Nova Scotia. Our home offers 24 hour support to residents who require nursing care, supervision, or assistance with their activities of daily living. Our inter-professional care team, including health care professionals and support services, work together to meet the physical, spiritual, emotional, intellectual and social needs of each resident who lives with us using a "people centred" care approach. Our modern, but home-like facility, was built in 2011. The home has nine residential type ‘houses’ that are complemented by larger public spaces with amenities like a tuck shop, hair salon and group activity rooms. There 11-12 private rooms per house and resident enjoy the privacy of their own room. Each house has access to its own open-concept kitchen/dining/living room and to landscaped courtyards. A 0.6 kilometer walking path circles the grounds. We have almost 200 employees who support our residents "living well in a place they can call home". Check out our pictures and services. Residents are encouraged to bring a few decorative and personal items to personalize their room. Our website is underway and several pages are still under construction. Some pages have not yet been developed but if you have any questions please do contact us. To find out more on our about us page. Linked below is a powerpoint presentation informing care team members about upcoming changes to our diet terminology. If you were not able to attend the education session please download and review the powerpoint below. 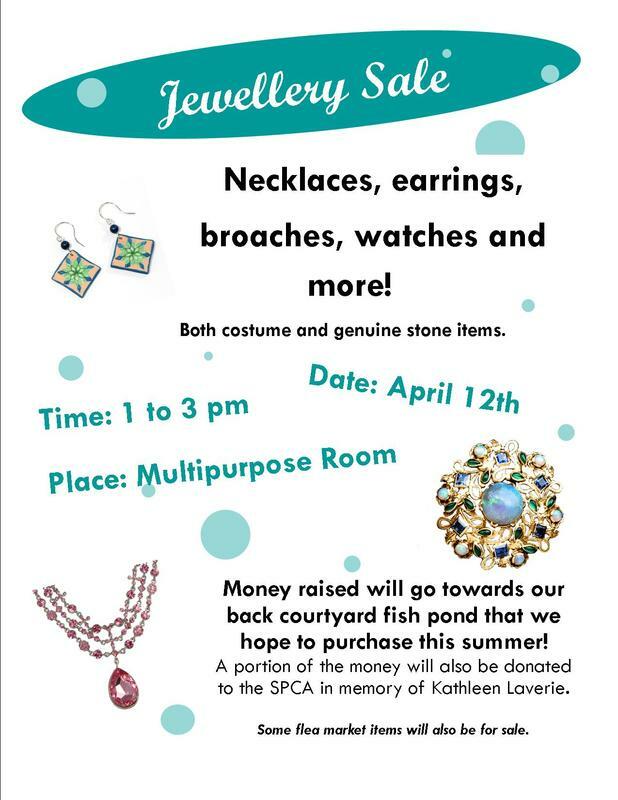 Kathleen Laverie loved her jewelry and also loved animals, at the young age of 50 Kathleen passed away. Her family donated a lot of her jewelry back to The Meadows. We had an auction/sale and raised funds for The Meadows and also gave a portion of those proceeds to the SPCA in her memory. Here is resident Susan, and our Recreation Manager Lynn dropping off the check. In celebration of Canada's 150th birthday, hundreds came out to help or pose in this great photo. The oldest is 105 years old! Care Team Members are invited to a general meeting on May 25th 2016 at 2pm in the multipurpose room. Please register with Phyllis at the front office if you plan to attend! 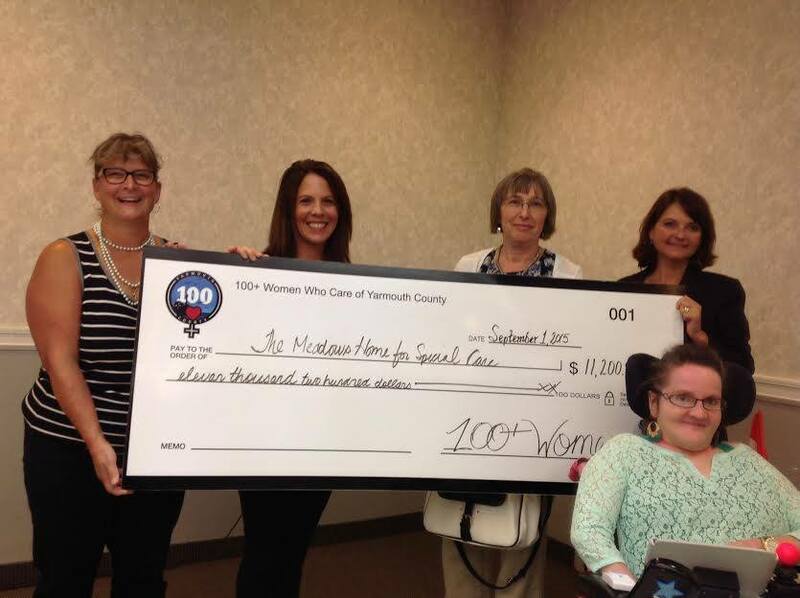 "The Meadows gets selected by 100+ Women Who Care of Yarmouth County, and bring home $11,200"
On September 1st, 2015, Kathleen Laverie (President of Residents Council, Lynn Leblanc, Recreation Manager, and Anna Babin, CEO & Administrator were given 5 minutes to present to the club who they were, what they do, how they serve the community, and what they would do with the money. Two other organizations also presented. Their name was nominated by a member of the club, The Meadows Medical Director Dr. Natalie Horton. The members of 100+ Women Who Care cast their votes that evening and had the difficult decision to select one organization out of the three to receive the generous donations of the members. The Meadows was selected and will put the $11,200 to purchase a wheel chair accessible glider swing. Our bus has arrived!" March 2015! The arrival of our new bus aligns perfectly with the commencement of Spring. 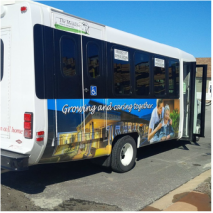 Through a decade of saving charitable donations, fundraising and smart spending, we were able to get a new bus. It arrived today!! Thank you Sandra Boudreau for your years of making this happen. Thank you for care team members, volunteers, residents and family members for your donations, fundraising and committment to The Meadows. Also special thanks for those who lent us their bus when we didn't have one! Anna Babin & Kevin Pool receiving the award on behalf of our Care Team. "The new bus will be arriving soon!" It's been well over 6 months since our bus broke down and we've been operating without one. We're happy to report that we'll be getting a replacement bus shortly. We are ever so grateful for neighboring facilities for lending us their bus. Thank you Nakile, St. Joseph and Vets Unit for agreeing to share your bus with us. You have no idea how much your help has helped us and our residents. "We're launching Staff Schedule Care"
In the spirit of continuous improvement and being more efficient in the way we do things, we're transitioning from a manual paper based scheduling system to an electronic system. This system will allow us to access schedules on-line, help reduce errors in payroll and increase productivity. "November 15th 2014 Resident show and tell today at 1:30pm"
Find out more about those who live at The Meadows and what's important or has special meaning and will display their items - such as a family picture, medal, piece of artwork, quilt, or other handmade projects. Whoot Whoot! " 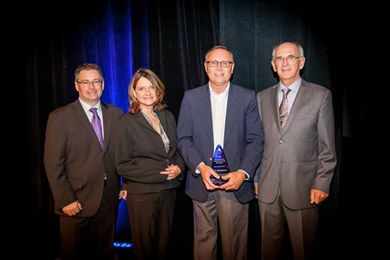 The Meadows "PUTS WASTE IN ITS PLACE" and wins the RRFP 2014 Mobius Award for Institution of The Year"
The Annual General Meeting will be held on two separate dates in order to provide Care Team Members with more flexibility to attend. We'll review where we are with our strategy, employee survey results, resident survey results, quality indicators, priorities and our accomplishments over the year. "The Meadows partners with WCB to deliver a safe resident handling program to employees"
Lifting, repositioning and transferring residents safely is in everyone's best interest. We're committed to safe and best practices. In partnership with WCB, The Meadows has build an interdisciplinary team to deliver an extensive training program for all employees. Our team is hard at work delivering this training. Our recreation department has ordered caterpillars this spring, and viewing centers for the neighborhoods. The butterflies are in the chrysalis stage and are expected to turn into butterflies soon. After a few days in the houses, we will release them outside in hopes they stay around. Just in case we got extra butterfly bushes! "Reminder our Christmas Holiday Craft & Bake Sale TODAY! November 28th 10am to 3pm!" This year our Annual Christmas Craft and Bake Sale will have a variety of crafts and baked goods along with some silent auction items such as a large gold framed mirror, an electric fireplace and a giant Christmas horseshoe that lights up! We will also be raffling off several donated items such as a homemade quilt, a plastic canvas doll house and a Christmas angel! Many of our residents have spent many hours making crafts throughout the year so come in and help support our residents’ programs!
" No Horse Show At The Meadows but a Christmas & Holiday Craft & Bake Sale on November 28th 10-3"
There will be no horse show after the parade at the Meadows this year, apparently the Vanguard printed this in the paper. We'd like to apologize for the confusion. The good news is we are having a Christmas & Holiday Craft and Bake Sale on November 28th from 10-3pm. Hope to see you there. We may look at a horse show at a later date. Please drop these off at the receptionist or recreation. Thanks so much! "Care Team Annual General Meeting on October 2nd 2013"
We will be having an Annual General Meeting for Care Team Members on October 2nd 2013 at 2pm in the multipurpose room. "We have a new MULTI SENSORY" room!" Did you know we now have a "multi-sensory" room? Employees, residents and resident family members are welcome to attend any one of our open houses on Sept 26,30, Oct 3,7 from 2-4pm if they wish to see the room and know more about it. Heather our Occupational Therapist or Jenelle our Recreational Therapist will be available during those times. The sensory room is along the administrative suite corridor where the clinic was situated, across from the physiotherapy room. "September is Continuing Care Month"
September is Continuing Care Month, a time to recognize this important sector and the dedicated people who are enriching the lives of Nova Scotians everyday. We thank our Care Team here at The Meadows and across the province for the critical role they have in , Making a Difference: Promoting Health, Well-Being, and Independence. On August 13th 2013 and August 15th, 2013 we are hosting a BBQ for all the great people who work here. Hamburger, Sausages, Hot Dogs, Salads, refreshments and desserts. We honor you for your outstanding contribution! Thank you for everything you do. Due to predicted thunder showers tomorrow, this event is postponed until August. -2013 We will let you know the new date!! Sorry for the inconvenience. We're excited to report we'll be having our first ever FIREWORKS on site at the Meadows for Residents, their family, and employees. Weather permitting we will be launching them this Saturday, July 20th, 2013 at dusk. Start time no later than 10pm- hopefully a little earlier! On Saturday, June 8th 2013, from 10am-3pm we are hosting a fundraiser-yard sale for one of our residents. The funds raised will go towards The Christmas Daddies Foundation. We will also be having a BBQ and Bake-Sale where proceeds will go towards the Resident's Council. Donations for the bake sale are welcome. If anyone wishes to donate baked goods they can do so this week (June 3rd - 8th) between 8:30-4:30 at the Recreation Department or Front Desk. Thanks so much everyone for their gracious Yarn donations! We now have plenty! "The 7 A's of Dementia"
The Meadows will be hosting a session for families and friends of residents on "The 7 A's of Dementia". Rosemary Clayfield, Challenging Behavior Resource Consultant from South West Health will be leading the free session. This session is beneficial to anyone wanting to know about how dementia affects the brain. If you or someone you know would like to attend, please register with Phyllis Ives in the business office, or by calling 881.3353. The session will be held on May 6th 2013 from 6:30pm to 8:00 pm in The Meadows Multipurpose Room. The session is free.